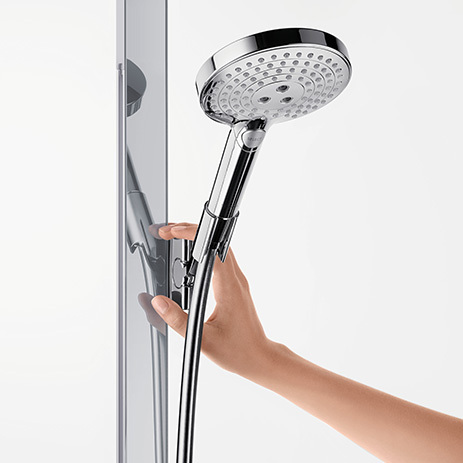 A complete package consisting of a hansgrohe hand shower plus wall bar: a combination that is second to none. 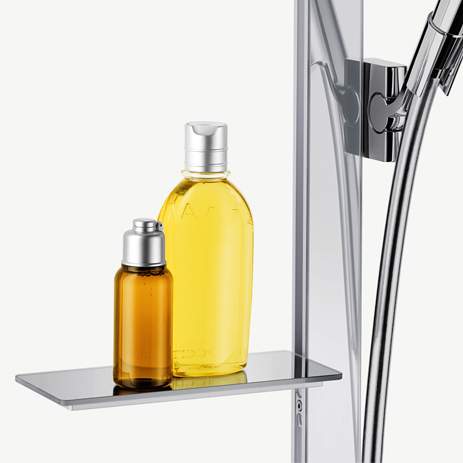 Virtually all hansgrohe hand showers are available as a set, together with matching wall bar. The bar is supplied in lengths of 65 cm and 90 cm as standard, while Unica' E is also available in 150 cm. However, the shower sets are not only impressive visually, but functionally as well. Show your customers duos that work together successfully - such as Raindance Select hand shower plus Unica'S Puro wall bar, Croma 100 or Select hand shower plus Unica'Croma wall bar as well as Crometta 100 shower set, combinations of Croma hand shower and wall bracket or the Unica Comfort range. Raindance E offers practical, modular shelves on the Unica E wall bar, which is available in chrome and white/chrome. Here you will also find complete solutions consisting of shower set and thermostatic mixer. The wall bars are robust, smooth and easy to clean. These enable the hand showers to be attached at the required height - for all body sizes, age groups and individual shower positions. Many of the integrated porters (shower supports) have inclination angles and offer convenient adjustment options in three dimensions. Ideal for multigenerational bathrooms: Unica Comfort wall bar. Thanks to TÜV-tested safety features, it offers the whole family extra comfort, support and flexibility - with less risk of slipping in the shower or bath tub. The horizontal part of the bar also acts as a grab bar. It has an extra shower support and a shelf for shower utensils. The hand showers guarantee an enjoyable shower - with up to four different jet types and innovative technologies such as Select, AirPower and QuickClean. Almost every hand shower comes in the EcoSmart version. This clever flow limiter turns your pleasurable shower experience into an even more sustainable one.